Guitar Hero is one of the most popular musical video games of all time, with several chapters released over the years. Each of these games has numerous Easter Eggs, little secrets that render homage or make discrete jokes. Check out some of the most fun Easter eggs in Guitar Hero franchise. When playing in Quickplay mode with Clive Winston and Xavier Stone, there is a chance that the end of the song guitarist put fire to his guitar, in a tribute to the legendary Jimi Hendrix. In Guitar Hero 2, including Xavier Stone plays guitar with his teeth when using his Star Power, as well as Hendrix did. When Clive Winston uses his Star Power in Guitar Hero 2 he pulls a violin bow and starts playing his guitar. This way of playing is a tribute to classical musician Jimmy Page, known by the movement. Pandora also performs this movement, but in case it only simulates without actually having a bow in hand. One of Hero Guitar 2 loading screens brings the message "Remember, NO STAIRWAY! ", Which is actually a double joke. In the film Wayne's World, the character Wayne tries to play the song Stairway to Heaven by Led Zeppelin but is prevented by an employee that points to a sign "No Stairway to Heaven", a joke with the fact that amateurs customers usually bad play famous songs in stores. The joke is double because the Led Zeppelin also refuses to release songs for Guitar Hero. In Guitar Hero 2 credits for the Xbox 360 there is a message that says "No pitcher was wounded in the production of this game. Except for one. Joel Zumaya. He deserved it. "This message refers to the baseball player Joel Zumaya, Detroit Tigers pitcher of the time that was left out of the league by pain in the wrist, caused by too much Guitar Hero 2. Ironically, Joel played on the PlayStation 2. In versions PlayStation 2 and Nintendo Wii game, try to play, or even practice, the song Through the Fire and Flames on Expert of DragonForce band level, the loading screen will say only "Good Luck!". This is because music is considered one of the hardest of the series, requiring a very high level of skill of the player. There are two achievements in Guitar Hero 5 Memes related to the internet especially popular. The first, "Over 9000" refers to a Dragon Ball Z scene with Vegeta character and can be obtained by scoring over 9000 points using the Power Star. The second, "All Four Bass Are Belong to Us" is a joke with a bad translation of the game Zero Wing and can be achieved by simply tapping a song with 4 bass. 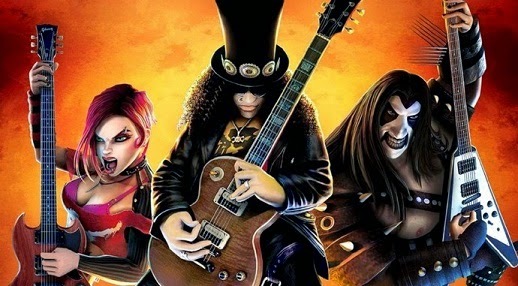 There are several references to World of Warcraft in Guitar Hero: Warriors of Rock because it was after the merger of Blizzard, creator of MMORPG, with Activision, creator of Guitar Hero. The emphasis is on Arthas Menethil account, the Lich King, which appears as a secret character to be unlocked. To achieve this you need at least 1,600 stars in Quickplay mode. There are tips in Guitar Hero: Warriors of Rock suggesting that the player does not try to play the guitar with his teeth unless you have a dentist in the family and instead try playing with the language, it would be a good challenge. As mentioned before, playing with his teeth is a reference to guitarist Jimi Hendrix, but no one is sure who is being mentioned in touch with the language. Could be Steve Vai or Ace Frehley of KISS.